Let's check out the best DJ mixers on the market. Feedback tells us the number 5 is the most popular choice so far, but which will you choose? Finding the best DJ mixer to suit your needs can be tricky. With a long list of manufacturers offering a bunch of different models it's hard to know where to start. I've put this list together so you can skip all of the shopping around. 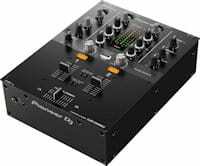 If you're looking for the best DJ mixer you'll find some great options in this list. But you may want to read all about choosing the best setup first, especially if you're new to DJing. The article will give you a better understanding of exactly what is available to you. It goes through a list of 6 possible setups and a stand alone mixer isn't necessary for all of them! Beginners should definitely go and check it out first > HERE. But if you're more experienced you'll want something feature packed so I've found a list of mixers just for you. This list is in no special order, every mixer comes highly recommended depending on your skill level and needs. If you want the best DJ mixer you'll find it here. Let's get to it! First up is the Allen & Heath Xone 23, and the Xone 23C that we'll get to shortly. This is a 2 + 2 channel mixer that means you can actually plug in and control 4 inputs. The Xone 23 features a simple but intuitive design perfect for beginners to intermediate and mobile DJ's. One of the Xone 23's stand out features is its connectivity. You don't usually find many terminals on cheaper mixers but Allen & Heath really gave us a treat with this one. It has a booth connection with a separate volume control which is perfect for you mobile DJ's. And you can plug in turntables or multi players thanks to the two phono/line connections. If you enjoy making mixtapes or recording your sets there's a record output. And if you love adding effects to get creative with your mix there's an FX loop. This will let you run separate effects units back into the mixers filter system. Mobile DJ's will also be happy that there's an XLR microphone input with full volume control and high/low pass filters. The main master output also uses XLR plugs. The main advantage of using XLR connections is their ability to transfer sound signals over much longer distances without signal loss, or interference. So sound systems with speakers that sit a long way from the DJ booth will benefit from these connections. Up on the top there's a beautiful replaceable crossfader (I've owned this mixer). I found the crossfader perfect for general mixing with the perfect curve. There's a fader curve switch but it's not built for scratching. I found that I could scratch with it but scratch DJ's may want to replace the fader with the compatible innofader. If you connect a third party FX unit it will route back in through the filter system for full control over FX. There's also a set of separate channel VU meters to keep those levels in check. And headphone controls with cue mix, volume control, and channel isolator buttons. If you need a mixer with DVS control Allen & Heath released a version with a built-in sound card. This version is called the Xone 23C. It comes bundled with Mixvibes Cross DJ software which allows a simple plug and play ability. You'll be able to play music straight from your computer using timecode vinyl records. This is done by simply connecting the mixer to the computer via its USB port. Read more about DVS and timecode vinyl in my article HERE. 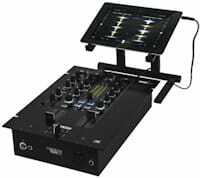 Overall this mixer offers a lot more than meets the eye, and could be the best DJ mixer for beginners, intermediate DJ's. And especially mobile DJ's! It could even appeal to advanced DJ's by using the Xone 23C's DVS control. The Pioneer DJM-250 MK2 falls into the same category as the Xone 23, and appeals to a wide range of DJ's. I was lucky enough to be able to fully test and review this mixer, you can see the full review HERE. This mixer has a built-in sound card and is Rekordbox DVS enabled. Rekordbox is Pioneers own DJ software that allows you to simply plug and play using enabled hardware. 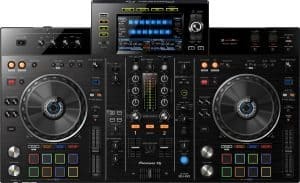 Pioneer have another version called the Pioneer DJM-S3 that is exactly the same, but comes with a sound card for Serato DJ. Serato is another brand of DJ software that is very popular. The DJM-250 MK2 has been popular with beginners through to more advanced DJ's. Beginners will like the simple uncluttered layout while advanced DJ's will enjoy the DVS capabilities and the Aux input. The Aux input will let you plug in external effects and drum machines. There's lots of terminals to connect your turntables, multi players, microphone and sound system. The only thing missing is a booth output. This means that it may not be the best DJ mixer for mobile DJ's that need extra monitoring. But it's still fine for smaller gigs and house parties. One of the main standout features is the Magvel crossfader inherited from the DJM-900NXS2. Pioneer claim this fader will last for over 10 million movements. It uses contact free magnetic runners and is buttery smooth. This will make it very appealing to DJ's that like to scratch. Another great feature is the sound color FX. This is a feature once again inherited from the DJM-900NXS2 that allows you to adjust the parameters of the filters. A feature very similar to the xone 23's mild or wild adjuster. The Pioneer DJM-250 MK2 will appeal to beginners through to advanced, and scratch DJ's. 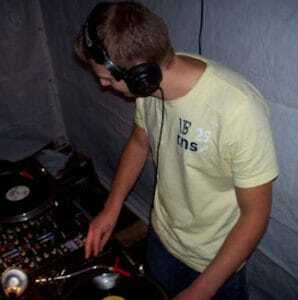 But mobile DJ's should bare in mind that it lacks a booth output. The Reloop RMX-22i comes highly recommended for DJ's that need iPad, Android, tablet, or smartphone connectivity. This will allow you to simply plug in your device and mix tracks using your chosen software. The mixer controls 2 + 1 channels which means you can play from 2 phono / line inputs + 1 device input. It's compatible with any DJ app that includes a split cue function. You can also use this function to play stereo output from production or sampler apps. Besides this awesome feature, the mixer also offers some really cool built in effects. You can chose from white noise, bit crusher, gate and high/low pass filters. With simple push button operation and knobs to adjust the parameters you can get really creative in the mix. The crossfader section is very spacious and the fader is fully replaceable. The RMX-22i is also innofader compatible, so scratch DJ's will love it. Another great feature to mention is that the channel fader curve can be fully adjusted. Most mixers feature a crossfader curve adjust but you rarely find channel fader adjust on mixers at this price. Moving on up you'll find a 3 band EQ with gains. In the middle there's separate channel and master VU meters. This is also where you'll find your master and booth volume controls. On the front you'll find a microphone and Aux input that both have gain and 2 band EQ control. You also have a 1/4" and 1/8" headphone input so you'll never have to buy any adaptors again. Just to note, Reloop do another version of this mixer with an extra channel. All of the features are the same but you'll have control of another phono/line channel on the Reloop RMX-33I. Overall this is a feature packed little mixer that will appeal to DJ's of all abilities. The ability to include a device makes it stand out, and this could really be useful for mobile DJ's. After all it's easier to take your tablet along to a gig than your laptop! This is the Pioneer DJM-900 NXS2, a 4 channel fully packed mixer that's recognised as the industry standard mixer around the world. If you want to practice on club equipment this is the mixer you'll need. The mixer has a built in sound card that supports Serato DJ, Native instruments, and rekordbox DVS control. This will give you a broader choice of software than any other mixer. So you can control any of these with no separate sound card purchase required. If you're DJing back to back it lets you plug in 2 laptops with a simple A/B switcher. This is also handy for DJ handovers at gigs or clubs to keep the music flowing and the switch over seamless. The Pioneer engineers really focused on sound quality and included a huge 64-bit processor to give crystal clear audio. And at the same time giving a warmer natural feeling sound. Many DJ's coming from regular club mixing say they can hear the difference in sound quality when using this mixer. The biggest feature with the Pioneer DJM-900 NXS2 is the built in effects. On this model there have been 4 additions bringing the total to 14 different beat FX. These can be assigned to each channel separately, or to the position of the crossfader, the master, or to the microphone. It also has the sound color fx panel similar to the one on the DJM-250 MK2 that we saw earlier. But this panel features 6 different FX with parameter adjust. Another really cool feature is the USB/jack input at the top right. This lets you connect an iPad to use the RMX-1000 app. This app mirrors the real RMX-1000 machine and lets you throw in even more effects, samples, drums, and more. The DJM-900 NXS2 also features the previously mentioned Magvel crossfader. This is the perfect crossfader for mixing and scratching that Pioneer claim will last for 10 million movements. Moving on up you'll have a 3 band EQ with gains and separate VU meters on every channel. It also has a master VU meter. Up above these VU meters each channel has another cool feature, the clip light. These light up when there is actual audio clipping, something ignored by many DJ's that causes damage to equipment. The pioneer DJM-900 NXS2 could be the best DJ mixer for the FX lovers out there. You'll never get bored with the number of different FX combinations this mixer has to offer. Especially when you throw in the RMX-1000 app to add even more effects and combinations. I think this mixer will appeal to everybody but advanced DJ's will really shine. The Pioneer DJM-S9 has been built as a true battle mixer that works perfectly alongside Serato DJ software. 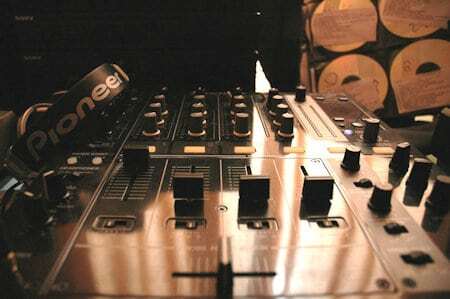 This mixer will appeal to all, but the scratch DJ's and turntablists will be at home with its functions. Down on the front of the mixer you'll see 2 dedicated sections. One for the microphone and one for the crossfader and channel faders. Firstly for all you scratch addicts and battle DJ's we have the fader adjustment section. Here you can reverse the crossfader and both channel faders. You can also fully adjust the curve amount of each fader with a simple rotary knob. Once you have your fader curves set you can also adjust the feel of the crossfader. Using a simple knob you can make the fader as light, or heavy as you like. You really can get the crossfader to work and feel exactly how you like it. 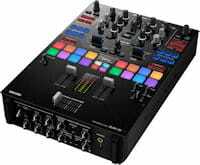 And it also comes with a Magvel crossfader capable of 10 million movements just like the big daddy, the DJM-900 NXS2. Next up the microphone section gives you a 2 band EQ and an echo option with adjustment. You can also control the volume and there's a talk over function to automatically lower the levels of your music. This all works in conjunction with high quality circuitry that removes unwanted distortion, making this great for mobile DJ's. It's also great for MC's and mix-tape DJ's that need to talk through their mixes. The DJM-S9 comes bundled with Serato DJ and DVS software. This means you can plug and play digital files using timecode vinyl/CD's without buying extra hardware. The performance pads work perfectly in conjunction with the Serato DJ software. This allows you to map and assign the pads to specific functions, you can even assign colors to the pads. This gives a stronger visual cue to help you remember what's assigned to the pad. It also has 6 built in beat FX buttons on the left, and 6 more buttons on the right. These buttons can be mapped with your favourite Serato FX and their parameters. You'll also have a parameter adjust knob in the middle with two big locking levers to quickly turn FX on/off. Above this you have the easy to use 4 beat loop button. You can catch a 4 bar loop with a simple tap of the button. This makes it very simple to create a loop on the fly while concentrating on other things. Another stand out feature is the dual sound cards with two USB ports. This means you can plug two laptops into the rear of the mixer, perfect for back to back DJing or smooth handovers. The VU meters feature red clip text that will light up if your levels are clipping, just as we mentioned on the DJM-900 NXS2. I see the levels abused at least once a week so this is definitely an important feature that will help DJ's to notice the problem. So once again this is the perfect mixer for the scratch DJ's. The Magvel fader with full adjustment will transform your scratching. And the performance pads and FX will bring something totally different to your routines. But that's not to say you have to be into scratching to have one. This could be the best DJ mixer for a variety of DJ's. The beautiful crossfader, effects, performance pads, and many other features will appeal to all. So your mission to find the best DJ mixer is complete. We've gone through the best of the best and you'll now know which one to choose. Thanks for checking out this article! If you're new to DJing check out my article on finding the best setup for yourself - HERE. And learn how to use your new mixer and all of its functions > HERE.